A group of Local Mums posed for television cameras and photographers with their babies this weekend to help save St Helier Hospital in South London. 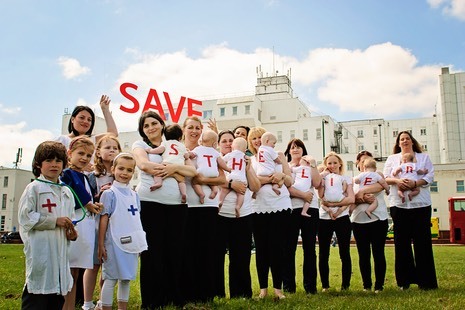 In a graphic display of their passion to stop the much-loved local hospital from losing its Maternity, Children's and A+E services, the babies wore t-shirts spelling out the words "Save St Helier" to draw attention to the proposed cuts. 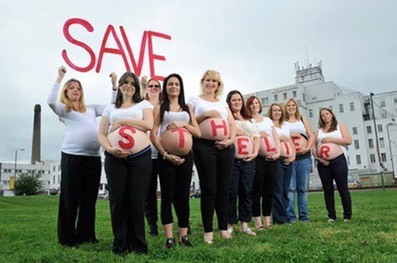 The photograph re-enacts the group Local Mums Online's famous photograph taken last September where mums painted the words "Save St Helier" on their pregnant bellies. Since then the babies have all been born but St Helier Hospital is under renewed threat. Talks to secure the downgrading of the iconic South London hospital moved a step closer to completion this month with GPs from Sutton CCG voting to accept BSBV proposals to cut frontline services and go out to public consultation. St Helier Hospital currently looks set to lose its Maternity, Children's and A + E services unless steps can be halted by the public consultation in the Summer. "We are livid that the government thinks it can take away our hospital services," Local Mum Rebecca Osbourne told BBC News cameras at the protest. "We need Maternity services and A+E in our local area. We can't traipse across South London for our ante-natal appointments and we need local emergency services or babies will die." "It is vital that women receive good local care at a time when they are at their most vulnerable and not have to struggle across London, some of them with toddlers in tow," said Kathy McGuinness, founder of Local Mums Online. "For those mums using public transport, the journey is horrific and the 45 minute ambulance times means lives will be lost as a result of these cuts." "It is an absolute disgrace that they can even think of closing our frontline services," added Local Mum of four Bonnie Ash. "My son would have died if these proposals were in place when he was born as he needed urgent neo-natal care." "We are outraged at these proposals," added�Kathy McGuinness. "This whole process has been completely undemocratic and unfair. The consultants and GPs making this decision are not local people and do not have local mothers' interests at heart. This is our hospital and we need local services for Maternity, Children and A+E. BSBV has got a fight on its hands if it thinks it can close our essential services to balance its books." Local Mum and photographer Kelly Rabie donated her services for the day and took the iconic photograph of the mums' protest while Local Mum Suzy Doyle was the official make up artist for the photoshoot. "I am delighted to donate my services to such an important cause," said Suzy. The protesters were joined by members of local group Carshalton Mums for a family-friendly picnic to show their support.